Hello, beautiful people! Happy new year! Like a lot of people, I have made a goal to eat healthier in 2019. Not a resolution, but just a goal to feed my body better. But … well, there is cake in my kitchen. Just sitting there all…cake like. I should just throw it away. Boop. Right in the trash. That’s what I should do. But what YOU should do is go shopping! Hey bunnies! So if you haven’t noticed, I’m taking a little Second Life break. Not a huge one, I’m not gone complete or anything. Just pulling back slightly for a mental health break. BUT… The Epiphany is still going on and if you haven’t been yet, you have until tomorrow! GO GO GO GO GO!!!! Hey bunnies, happy Monday! 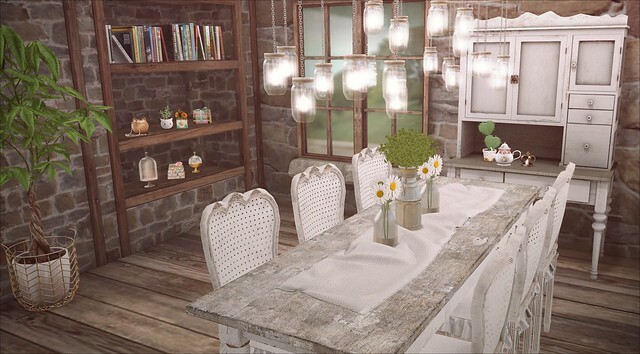 You know, one of my goals is to have a beautiful dining room one day in my offline world. The dining area in my house is actually where I have my computer! Who knows. Maybe one day I will put my foot down and get all the furniture in here moved around I’ll finally get the dining room I really want. 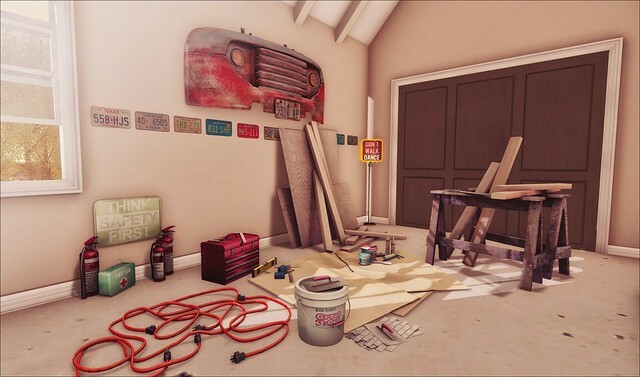 But until that day comes… there’s always Second Life! Hey bunnies! So I have a phobia. I’m actually scared of clowns. I mean…not just scared. More than scared! I know that this is a pretty common fear, but I did want to warn you before proceeding with this blog post. The Epiphany starts TONIGHT at 10pm!! I can’t promise it’s a clown free experience, but sometimes you just gotta close your eyes and run in! Hey bunnies! Do you ever see an item and then you are just inspired by it? That completely happened to me today! And I’m definitely a huge believer in that if you get bit by the inspiration bug, you need to run with it! So while this photo may be a little “darker” than my usual, trust that everything is okay with me! I just got a photo in my head and had to do it! The Liaison Collaborative opens up on the 7th, and MudHoney will be there with the Mae Garden set. The table and chairs are lovely! Now I got super inspired for this photo by the set in the “Rusty” color, but no worries! There are bunches of perfectly painted and bright colors to choose from as well! The theme for this month’s TLC is Vintage Summer, and these remind me SO much of the chairs that were out at my grandma’s house! Hello, bunnies! When I was little, Sunday afternoons almost always meant a drive into the country. My dad loved to just get my mom and me into the car and we’d drive out somewhere for a while, usually until we got to a truck stop they liked so we could have lunch before driving home. It was always lovely. Of course these days I’m the one behind the wheel and there’s not as much country, but sometimes we still take off outside the city limits, even if it’s just for a moment. 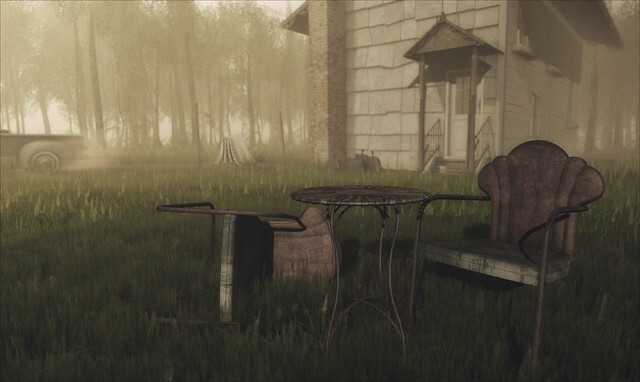 Shiny Shabby opens up at noon today and let me tell you, I was just itching to get my hands on the Pearl Cashmere Ensemble by Valentina E! The sweater and the pearl studded skirt are just darling! This is definitely an outfit that is perfect for fall. Show Em What You’re Worth! Hello, bunnies! Do you think of yourself as being very fit? I don’t really think I am normally given that I’d rather sit than go for a run, but I got a Fitbit for my birthday and was invited to a challenge and well… given my highly competitive nature, I was running like crazy at 11:59pm to get every last step in that I could. I guess I’m more fit than I thought! Uber this month is all about being athletic, so get your fitness on! Truth is at Uber with the super cute Olympia hair! This hair comes with a visor [I love hair with accessories!] but there is also one with an alpha hairline. Kinda like having a hairbase, but it’s actually on the hair. I love it and it worked with my head really well, but you may need to adjust your forehead a bit to get it to work. Hello, bunnies! I took this photo a couple of days ago but a weird and sudden illness knocked me down! No fun! Luckily I’m feeling much better, so now I get to show you pretty stuff! 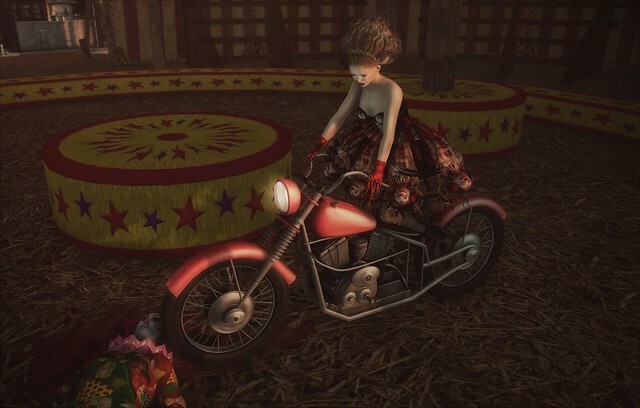 The Arcade ends on Tuesday, so hurry on over if you want to get awesome things, like the trailer from Consignment‘s The Open Road collection, or the Tree Stump Garden from Half-Deer‘s Spring Eternal set. Uber started a few days ago and it’s a Freestyle round, so the designers were able to do what they wanted. I am in LOVE with Truth‘s Armelle hair and the Kiania heels by Eudora! Also, the new Grazia skin by Glam Affair at Uber is my new fave! And if you haven’t heard, coldLogic released some super cute new spring dresses this week! I fell hard for the Lukonen dress because it’s just so fresh and cool.